In memory of the upwards of 50 Muslims killed in the Christchurch shooting. Originally posted Jan. 9, 2019. A significant wing of western societies wishes to represent Muslims as hate-filled and war-mongering. Very little publicity is given to their actions for love and peace. The Good News Network features a number of stories down through the years in which Muslim communities in several countries have taken the lead in actions for the latter. “As British Muslims, we believe that the time has come to speak out. For far too long, anti-Semitism has gone unchecked,” the ad continued. “Eradicating it is a challenge faced by all of us. 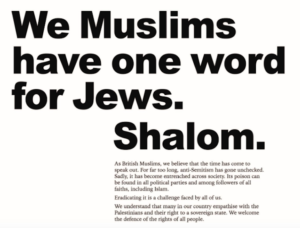 The ad, which was published in the Telegraph on Thursday, was signed by such major advocacy groups as anti-extremism group Faith Matters; Muslims Against Anti-Semitism; and the Association of British Muslims. According to the Jewish Telegraphic Agency, the statement was a welcomed follow-up to the Board of Deputies of British Jews denouncing Islamophobia last week. On New Year’s Day, a devastating terrorist bombing at a Coptic Christian church in Egypt killed 21 people and injured 79 others. It was assumed the culprits were Muslim extremists, intent on targeting those they saw as heretics. 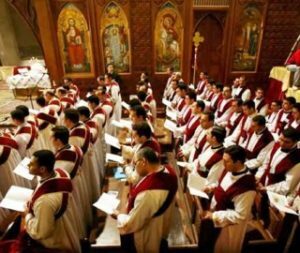 The following week, as Egyptian Copts attended mass at churches across the country to celebrate their Christmas, “thousands” of Muslims, including “the two sons of President Hosni Mubarak,” joined them, acting as “human shields” to protect them from possible terrorist attack. Europe’s Jews face rising anti-Semitism in some countries, but multiculturalism is far from dead. 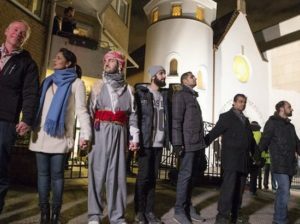 Today, more than 1,000 Muslims formed a human shield around Oslo’s synagogue, offering protection and solidarity with Jews following a violent attack in Copenhagen last weekend. Chanting “No to anti-Semitism, no to Islamophobia,” Norway’s Muslims and others formed what they called a ring of peace during the event organized on Facebook. “Humanity is one, and we are here to demonstrate that,” Zeeshan Abdullah, one of the organizers told the crowd of Muslim immigrants and ethnic Norwegians who filled the street around Oslo’s only synagogue. While thousands of people are still in bed sleeping off the effects of their New Year’s Eve festivities, these young Muslims woke up early to clean up the aftermath of last night’s partying. 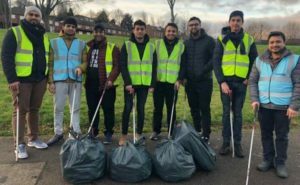 Over 1,000 young members of the Ahmadiyya Muslim Youth Association (AMYA) took to the streets of 50 different UK localities and cities for a New Year’s Day clean-up. The young men and women even kicked off the event by hosting a special prayer for the new year before they donned their high-visibility vests and tackled the streets with garbage bags in hand. “From Luton to London, Glasgow to Guilford, Cardiff to Croydon, across the entire country 1,000 members of AMYA participated in the New Year’s Day clean up,” said British Ahmadiyya Imam Qamar Zafar. “What War on Terror?” OpEdNews, Oct. 28, 2008, at http://tinyurl.com/2ujmx9s.